Trading, Importer and Exporter of Gold Bronze Powder and Lethophone, etc. To offer this attractive range of products, our organization is linked with number of vendors of this domain. They have an ultramodern infrastructure facility and a team of professionals to compose the offered range of products. With the help of our certified vendor, we have been able to products the diverse requirements of our clients in best possible manner. We are one of the topmost organizations of this domain, engaged in presenting a wide range of industrial chemical products for our valued clients. Offered assortments of the products are processed as per the predefined industry guidelines and norms. To meet the various requirements of our valued clients, we are offering these items in various packaging options. 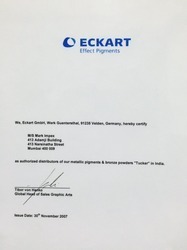 We are authorise distributer of Eckart.